Corca Dhuibhne rears powerful women. I have elderly neighbours here who grew up living lives that would flatten me in a week. They kept house, looked after kids and old people, milked cows, made butter, cared for calves, raised poultry, grew their own food, and cooked it in iron pots over turf fires. As children they walked barefoot to school. As adults they often went barefoot too, and worked in the fields with the men; a friend of mine remembers women with legs and ankles cut raw by the stinging wind. Electricity and piped water didn’t come to the houses in this village till the nineteen sixties. In the days before they got here, women washed everything by hand, carrying water from the spring, and boiling it on the fire. Last winter, during a week of power-cuts, I got an inkling of what that meant. And I just had to wash dishes. They washed laundry too, for households of up to fifteen people, and dried it on lines or on bushes. Living miles from help, and often too poor to pay a doctor, women were their own healers. My neighbours remember how stinging nettles were used to treat rheumatism and people drank hot milk with onion juice for a cold. Women here still remember those cures, and they still trust in bone-setting and midwifry skills passed down from mother to daughter across generations. Nobody here wants the hard times back. But I’ve often heard friends envy their mothers’ and grandmothers’ spiritual and emotional strength, and marvel at their resilience. They call them ‘mighty women’, and they love their feistiness and self-respect.Those qualities are celebrated each year here, at Nollaig na mBan. 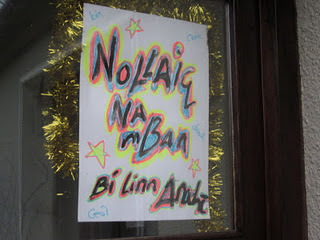 Nollaig na mBan means ‘Womens’ Christmas’. It’s a traditional Irish occasion, held on January 6th, when women of all ages get together and party. They meet at home, or go out in groups, to eat, sing, drink, dance and generally hang out together. The pubs and restaurants are full, and the celebrations often spill onto the village streets. Grannies and aunties dance with little girls and teenagers, friends get up and sing songs together, pubs lay on karaoke, and houses are full of music. As I write this, texts are flying all over the peninsula as people get ready for Nollaig na mBan. Like the mighty women it celebrates, it’s a tradition that’s still going strong. Liffey Sound 96.4fm Community Radio Station in Lucan, Dublin is celebrating Nollag na mBan 2013. We will play host to a gathering of ladies in Lucan. You are invited to this gathering on Sunday 6 January 2013, in the O’Neill’s Lucan Inn. As part of this celebration we would like to display testimonies to Mná na hAite (local women) & Mná as Lear. Testimonies should be forwarded to info@liffeysoundfm.ie for display on the night. What better way to celebrate Nollaig na mBan than surrounded by testimonies to the great women of Lucan & Abroad. Better Still we invite you to drop in to join with us as we celebrate – a celebration that will include the 3 Great C’s Ceol, Caint agus Craic. 2013 The Year of the Gathering check http://www.gatheringireland.com you’ll find Liffey Sound there.